Last night just before going to bed I received an email from a relative. It stated: "This will curdle your blood and curl your hair." 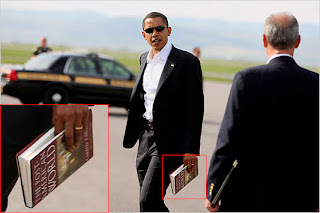 There was a photo of President Obama holding a book and the book was enlarged to show its title. Apparently this is an old email that has been circulating around for a while. The title of the book is "The Post American World". "The name of the book Obama is reading is called: The Post-American World, and it was written by a fellow Muslim. "Post" America means the world After America ! Please forward this picture to everyone you know, conservative or liberal. We must expose Obama's radical ideas and his intent to bring down our beloved America ! " Don't you just love the choice of words? : "fellow Muslim" and "Post America (sic) means the world after America" and "our beloved America". Don't you just love how these folks check their facts and make a pretzel look straight? Well, I was ready for bed and had been dozing off a bit 'till I read that email. It curdled my blood and curled my hair all right, but for a very different reason than intended by the intrusive missive. I decided to check the facts for myself. Wikipedia was informative, and gave a great deal of information about the book, its thesis and the author. If anything the book is PRO-AMERICA! and not at all what the email wants you to believe! It was late, but I emailed the page to all recipients anyway and went to bed a little shaky. 1. an evil deed: wicked, bad, wrong, immoral, sinful, foul, vile,dishonorable, corrupt, iniquitous, depraved, reprobate, villainous,nefarious, vicious, malicious; malevolent, sinister, demonic, devilish,diabolical, fiendish, dark; monstrous, shocking, despicable, atrocious,heinous, odious, contemptible, horrible, execrable; informal lowdown,dirty. .
How can people be so IGNORANT? Why do others just believe what they read? Why do they insist on spreading lies and hatred. What would be the point? I did get two replies, one from someone I don't know who bandied "free speech" around like it was permission to be ignorant; the other was from another, more enlightened relative who was as offended as I was. Thank god. There, I feel a little better now. 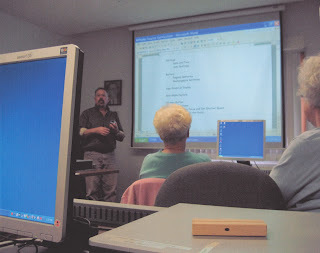 I've been "teaching" computer basics to Seniors at the local senior center since last September as a volunteer. Usually in 4-week segments with vacation breaks in between. This past week we did digital photo basics. It was quite a challenge. It was only a 4-hour course over two days. I wrote the curriculum (a work in progress) and planned the lessons. We covered camera basics, downloading from the camera or memory card, basic editing, emailing, and printing photos. 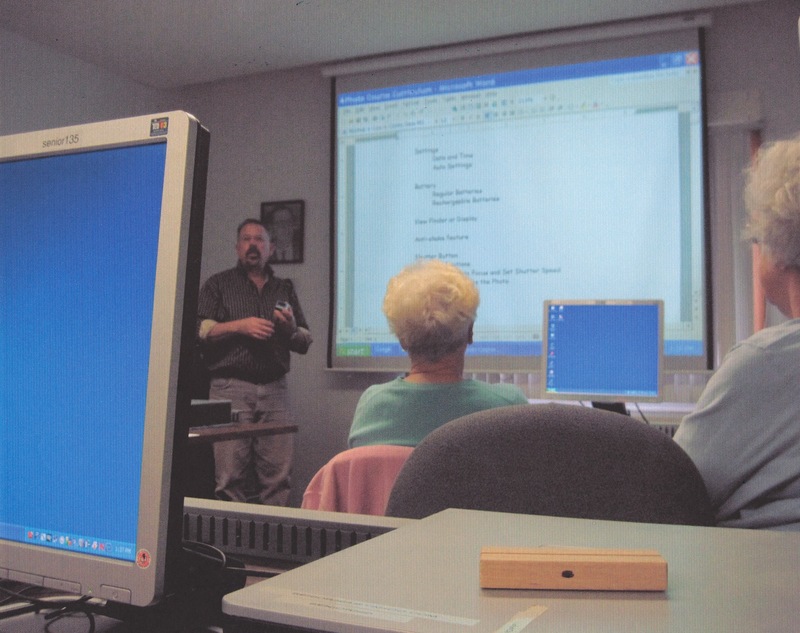 The classroom has eight computers running Windows XP. So that was the first challenge as I'm so used to my Mac. The fact is we learned together and everyone seemed to enjoy the course. Larry and his wife had a camera for years and wanted to buy more memory cards till they learned that you can download the pictures and "erase the card". "It's a miracle", Larry exclaimed. Every time we covered a new feature, he'd blurt, "It's a miracle." It really made the class fun. But I think I had the most fun. I learned new stuff. Working around Microsoft and Picasa was interesting, and the "students" were impressed that we were all learning together, even the "teacher". I have two weeks till the next class. I do the same course again, for a different group of 8 students. But next time, I hope I'll be a little more proficient. Miracles? Yeah, I guess "It's a miracle". We save vegetable scraps for the compost pile. We recycle cans and bottles. We dry clothes on the line whenever we can. We grow "organic" vegetables. We don't buy a lot of packaged foods. We re-use just about anything. We don't use pesticides or herbicides so we have grubs and weeds. We don't use a lot of chemical products like "air fresheners", cleaners, or cool whip. We don't even buy the newspaper. But this is nothing - a mere drop in the ocean. But in one day, 42,000 gallons of crude oil are spilling into the ocean off of Louisiana. In one day the efforts of millions of contentious citizens and environmentally conscious individuals are offset by an oil well gone wrong. And the worst has not even happened yet. What are we doing to our world? What insanity. Leon called me out yesterday morning to take these pictures of a cat in the wild, not a wildcat but one that seems to be at home in the woods in our backyard. Got all the cacti into the garden yesterday and they're getting rained on today. The yard and garden on 2.75 acres is my planet fitness. But going out for burger and fries at Blondies' cancels out the fitness part. Oh, well, the best of both worlds, so to speak. Hurrah for the Evangelical Lutheran Church of America has come out. Read Tom's post. This is an aromatic plant called "Sweet Fern", Comptonia peregrine. Its fragrance is neither pleasant nor unpleasant, but very strong. Yes, Dandelion "Dent de Leon"
Japanese Knotweed. It grows everywhere it can get a foothold: fields, the sides of driveways and roads. It grows THROUGH asphalt. It grows inches or more in a day at this time of year. It has a root system that travels underground so that even if you pull it up, the roots will grow again and find their way to another spot. It is only one of many of Mother Nature's tools of revenge. It is definitely TICK SEASON. Last night I felt really lousy, aching all over, tired, groggy, not quite feverish. Took Acetaminophen and felt a little better. This morning I found a tiny tick attached under my arm and a nice red area. Yanked the cusser out with a tweezer. This achey feeling was back today. Now I've had a hundred tick bites, if I've had one. Its a local hazard if you're a gardener or a hiker. But I've never felt this icky. Years ago I received two doses of a lyme vaccine for humans which they took off the market before I got my third shot. This makes me test positive for Lyme disease antibodies. Will see the doctor tomorrow, but I don't know how they will figure out whether I've contracted the actual disease or not. I couldn't imagine how the woes of the Catholic Church could get any worse. But apparently they have. Enlightened Catholicism: The Other Shoe Drops lets us know about other priestly transgressions. And this is another factor debunking the whole argument blaming homosexual priests for the all of the abuse and troubles of the Catholic Church. Just had a nice comment on "Around the Yard" from justjock whose blog I tried to visit. Safari acted viral when I tried to open it, Firefox opened it fine but I was not able to post a comment - it seemed not to accept the comments or my user account. There was no "word verification" or any indication that the comment was transmitted. When posting, the screen refreshed with a blank comment box, like nothing had been entered. Does anyone else experience these quirks? My father's Uncle Sal was a barber. My father was sent to Uncle Sal's barber shop to learn the trade but he hated it. Dad said Uncle Sal used to keep a stash of liquor in the basement and would offer his good customers a drink of whisky or grappa during prohibition. He lived to 104 or 105. Not to imply any correlation among these facts. My Uncle Dom, dad's brother-in-law was also a barber. I would go to his shop after school for a haircut. I think Uncle Dom was a little bi-polar or would feign an ornery attitude when it served his purpose. He had a dry, obtuse sense of humor and would delight in pulling one over on you. Haircuts were seventy-five cents or a dollar back then. Nothing fancy. Just your basic cut. Plus there was always the entertainment when I arrived - watching Uncle Dom sharpen his razors with shaving cream on the sharpening stone and finishing them on the leather strap. It always seemed like a mysterious, meticulous process. He never used a razor on me, of course. I was still in peach fuzz. Uncle Dom didn't live to 100 but some said he died with the first dollar he made. I've only had three good haircuts in my life. None were from Uncle Dom. My hair does not lend itself to a style of any kind. Most of the worst cuts were from students at some haircutting school or another, or a "stylist" at a haircutting factory like SuperCuts or CostCutters. (Like the time the kid kept cutting and cutting until I finally said in a panic, "Stop, just stop." And had to buy a ski hat against the Vermont winter wind.) The last good one was actually at a SuperCuts in St. Petersburg, FL a few weeks ago. I'm sure it was because the stylist was a guy, family of course. You don't see any guys working at SuperCuts in our town. The other two decent outcomes were probably ten years apart. So the price of a haircut at Supercuts is now $14.95 plus tip. And that's for ten or fifteen minutes in the chair. And they insist on using clippers, so it seems there's little skill involved. I'd do it myself if I could see the back of my head. They've gotcha there, don't they? I know one of the reasons why cuts have gone up in price. It's because of the "Bald Look" that has become so popular in recent years. Guys used go to the shop to trim what little hair thay had and to do their best to make the comb-over look good. Then bald became as in-style as ear piercing and tattoos. Even guys with hair are shaving it all off - and doing it themselves. Thus the loss of a significant customer base for hair stylists and barbers. So they are just trying to make up for lost revenue, I guess. But one of the nice things about small towns is that you can usually find a freelance barber or stylist and get a good (or at least a tolerable) haircut for ten bucks. Went to one today. Had it cut pretty short. Leon hates it. Mostly salt is showing now. Leon used to say he liked my "Salt and Pepper", then one day he remarked, "you've got a lot more salt in your pepper." Just for Men, see you in the morning. I haven't been following the news too closely. Got pretty tired of the Catholic/Vatican/Coverup/Whatever. It just seems to be going nowhere. And I have pretty much the same feelings about the US political scene right now. Still busy doing some paid jobs (grant writing) and even though it doesn't bring in much of a paycheck, I don't regret my decision to freelance. No commute, and even better - no delicate personalities to tip toe around or make nice-nice to when I haven't slept well or am otherwise in a nasty mood. Remember that truckload of concrete pavers I got for free? Well, I had no project in mind and didn't know where to unload them. Leon suggested I put an ad in Craig's List while they were still in the back of the truck. Got a taker for $100. Not too bad for a good workout and a drive to deliver them a few towns away - and two cute guys helped unload the truck to boot. Hope the beautiful spring is not followed by a summer of strange meteorological phenomena caused by the volcanic eruptions in Iceland. We have a friend who just went to London for two weeks - he may be there longer than he planned if the planes can't get off the ground. We've never had a bird fly into the glass windows on our sunroom. Too bad for this little fella, a pretty Cardinal. Well let me go read some of you guys' blogs now. See ya. The weather here in the Northeast has been spectacular and summer-like. Sunny and in the hight 80's. I am way ahead of schedule with yard work this spring which means more time to enjoy the yard and gardens. Yesterday I got a truckload of free pavers. Lifting close to 2000 pounds of concrete in about an hour was quite a workout for an old guy like me. Problem is, I don't have a specific project in mind. Did some Roto-tilling today. Getting that straight line along the front is a real challenge. I'm a little off as you can see. Now this monstrous invention gave me a real workout. I think plowing behind a Wild Horse would have been easier. The Prickly Pear Cacti are getting erect. They lay flat to the ground in winter, then perk up in spring. These are a variety native to the Northeast, particularly Martha's Vineyard and the New Jersey Shore where I've seen them growing wild. I've had these specimens or their ancestors for over 25 years. The cactus garden gets full of leaves in the fall and winter. I don't suppose folks in Arizona have to blow Oak, Maple and Birch leaves out of their cacti. This is another monster to deal with. It works for 20 minutes or so, then quits. After a good night's rest it will work another 20 minutes tomorrow. These are cacti specimens that are not winter hardy so they've been in the basement all winter. Some are bare root, some are cuttings. These are the potted cacti that have been in the sunroom all winter. They are lined up on the stone wall ready to go into the cactus garden. This year I am trying to get some seedlings started. Flowers, basil, some hot peppers, lettuce. A new see-through Pride Flag...oops, that's upside down, isn't it? But they are in fact "fiddle heads" - newly sprouting ferns. A springtime delicacy among French Canadians. Getting the outdoor shower ready to hook up. We have hot and cold water outdoors, just for this. "Snow Drops" in 80 degree weather. The Geranium that's been in the sunroom all winter. This was one of the first gifts that Leon gave me; it made me cry because it's so sentimental. It's got to be 20 years old by now. It is also the name of one of my favorite songs. But someone needs to change the words to make them suitable for same-gender couples. Montauk Daisy - seen a lot on Cape Cod. Putsing around the yard has its therapeutic value. There's weight lifting, and using the machines as well as the relaxing chores and the visuals. I haven't been following the Vatican or the gay press the last few days. I'm sure not much has changed for the better. What a gorgeous spring this year. What a gift! Enjoy!